Oak Ridge - "Your Home Team Advantage!" Oak Ridge is located in Guilford County, just northwest of Greensboro with a wide variety of beautiful homes. The Town became an incorporated municipality in 1998 and is governed by a five-member Town Council. Oak Ridge is approximately eight miles northwest of Greensboro North Carolina’s third-largest city, and it is a part of the Piedmont Triad urban area. Until the late 1990s, the Oak Ridge area was mostly rural farmland with numerous tobacco farms. However, since its incorporation as a town in 1998, Oak Ridge has seen rapid growth in its population. Many of the area’s farms have been sold to developers and turned into upper-class housing developments, and several shopping centers have been built along the NC 68 and Oak Ridge 150 Road intersection. The town is home to Oak Ridge Military Academy (ORMA), a private, coed, college-preparatory boarding school. Founded in 1852, it is the third-oldest military school in the nation still in operation, and it is the official military school of North Carolina, as designated by the state legislature.This area is also proud to have some of the county’s highest performing public schools. 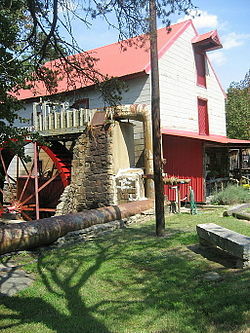 The Old Mill of Guilford is a popular, scenic tourist attraction and has long been a favorite subject for artists and photographers.The Old Mill of Guilford was founded in North Carolina on Beaver Creek in 1767 to grind grain for the early settlers of what is now Guilford County. Today, the mill continues to produce all-natural, stone-ground, whole grain foods, just as it has for over 240 years. The towns main park Oak Ridge Park includes two lighted multi-purpose football/soccer fields, two lighted baseball/softball fields, scoreboards, paved and unpaved walking trails, picnic shelters, a large playground, a pond, a concession stand/restroom facility, and a second restroom building. Along with those features, there are support amenities that include landscaping, several doggie stations, birdhouses, picnic tables, park benches. The park also offers open grassy areas adequate to hold large community activities and events. Oak Ridge is a great place to live play and enjoy life in a rural atmosphere while convenient to shopping, work , and the Piedmont International Airport. Come see for yourself you will love it. TWO HOMES ONE ESTATE! This beautiful 1 1/2 Brick Transitional is part of a 7.33 acre Estate which is MLS # 925782. They are to be sold together for the listed price. This home has a dramatic Kitchen & dining room combo that has vaulted ceilings that open up a window wall. Main level Master BR has vaulted ceiling and large bath and walk-in closet. Lg Sunroom on the rear of home. Hardwoods throughout majority of floors. Price includes main house also. Home is being sold at its current state of construction with 9700 sqft permitted and potential for 20k+ under roof. From the 2x8 framing to the solid poured foundations this home is a step above in every area! 12ft ceilings on the main, 10ft on the second and 6ft wide hallways w/ barreled ceilings. Indoor pool & patio, 2 theaters (30 seats w/ balcony), 2 exercise rooms, multiple kitchens, 2 lane bowling alley, 3 bonus rooms, two-story library and the list goes on! See agent only remarks. Stunning immaculate custom home with your very own summer resort. Enjoy a completely finished lower level equipped with wet bar, exercise room and your very own home theater complex plus a walk out access to the pool complex. The pool is a custom resort pool by guilford pools complete with and out door kitchen, jacuzzi, sonos system and cutom LED lighting. Over 6300 sq ft of home can be your's. Schedule your appointment today! This farmhouse style home features unique details & quality craftsmanship. Spacious & open floor plan perfect for entertaining. Featuring a chef's kitchen, industrial oven, double sized fridge/freezer & massive kitchen island. Main level Master Suite with attached office/sitting area, large bathroom and closet that will not disapoint with custom shelving. Endless storage & expansion options with a full walk out basement plumbed and wired for additional bathroom & kitchen and almost 859 sq ft above garage. Magnificent custom home built by Friddle and Company. Beautiful custom features throughout. Guest suite & master are conveniently located on main level. Spectacular kitchen has custom cabinetry, granite counters, spacious breakfast area & walk-in pantry. Retreat to the master bedroom with tray ceiling and spa like bath. Upstairs you will find two spacious bedrooms, versatile vaulted bonus room plus media room & walk in storage. Covered rear porch is perfect for enjoying a cocktail! Northwest Schools! NEW PRICE! If you love to live outside this is the new home for you! You can enjoy the pool, fire place, patio and deck of this home which is situated on a private wooded lot in Oak Ridge. Large gourmet kitchen w/ island opens to family room. 4 BR, 3 of them with private baths. Large Bonus room. 1500 sf of unfinished basement ready for expansion 3 car garage. Northwest schools. Cut-de-sac. Close to highways and Oak Ridge shopping. Don't miss floorpan and virtual tour. Magnificent new home by Naylor Custom Homes in Parkers View at Bethel Ridge. This spacious well designed home offers an outstanding floor plan. Beautiful dining and executive study. Fall in love with the chef's kitchen that opens to a stunning great room with fireplace. Dazzling architectural features throughout. Guest suite on main features a private bathroom with walk in shower and large closet. level. Upper level includes 2 spacious bedrooms and large bonus. Dazzling architectural features throughout!